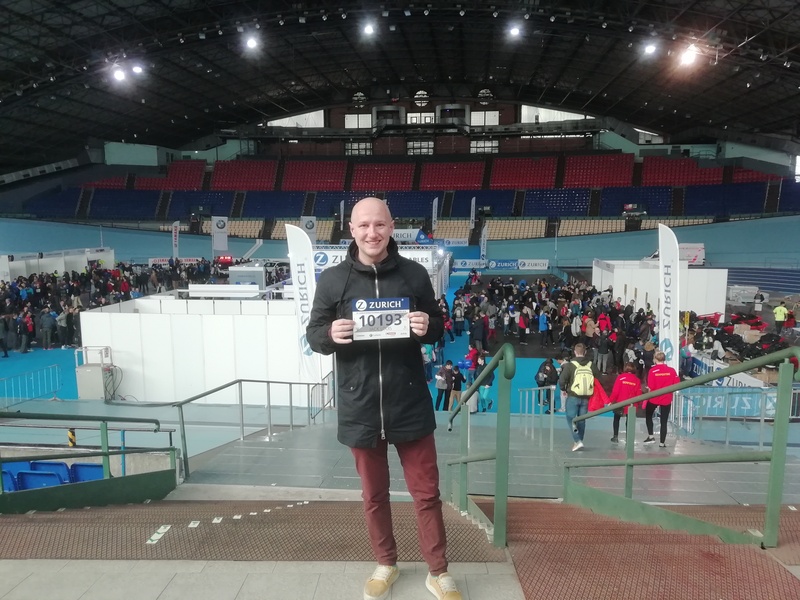 Having already run one half marathon in 2018 in Vitoria-Gasteiz, I’d told myself that it would probably take something special to make me run another. I ran that one in May for a couple of reasons, but mainly to raise money for Brain Tumour Research in my Mum’s memory; the JustGiving page can still be found here *COUGH COUGH*. 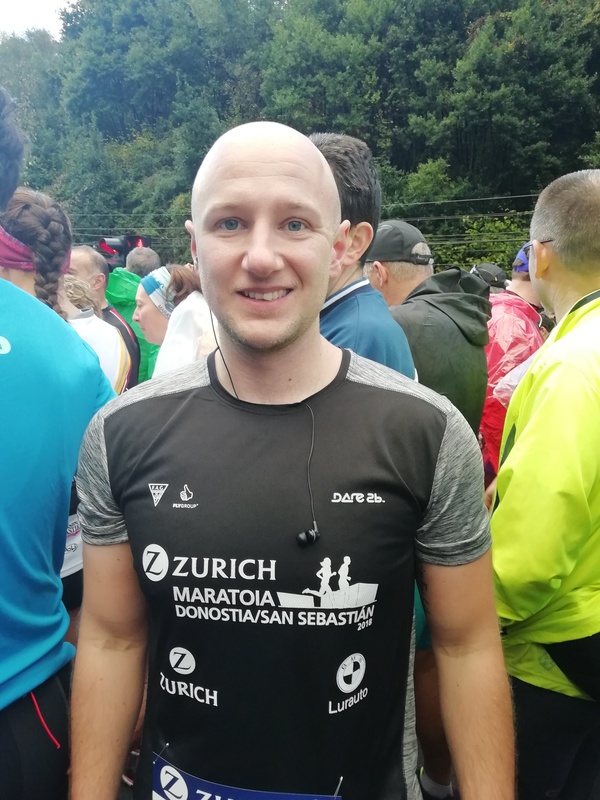 At the time I had no idea what that ‘something special’ would be that made me want to put myself through a few months training so I could run 13 miles on a cold, drizzly November morning in San Sebastián. However after returning to Durango in my worst shape for years having eaten just about everything I could get my hands on in London, Jakarta and Tokyo, that something special turned out to be a desperate need to get back in shape! For what it’s worth, I don’t regret a single meal – not even the one I found a staple in. My best ‘why the hell am I doing this again?’ face. I arrived in the city the day before with the plan being to catch up with some family in the area before an early night in preparation for the run ahead. The first port of call was the Velodrome at Anoeta stadium (home of Real Sociedad) to collect my runner’s pack. Unlike the Vitoria race where it was just a couple of tables set up in a shopping centre, this seemed a much bigger event and the whole building was packed out with queues snaking all over the place. In the end I had to join one queue to get my number and timing chip before joining another to collect my t-shirt and other goodies which – rather bizarrely – contained a carton of meat stock alongside other, more logical, things. After preparing for the race in the best possible way with a few beers I had an early night ready for the 9am start the next day. Unlike Vitoria the temperatures were unsurprisingly much lower here and the light rain didn’t exactly fill me with joy. I dropped my stuff at the designated (and very well organised!) baggage section and after a few stretches made my way to the start line. 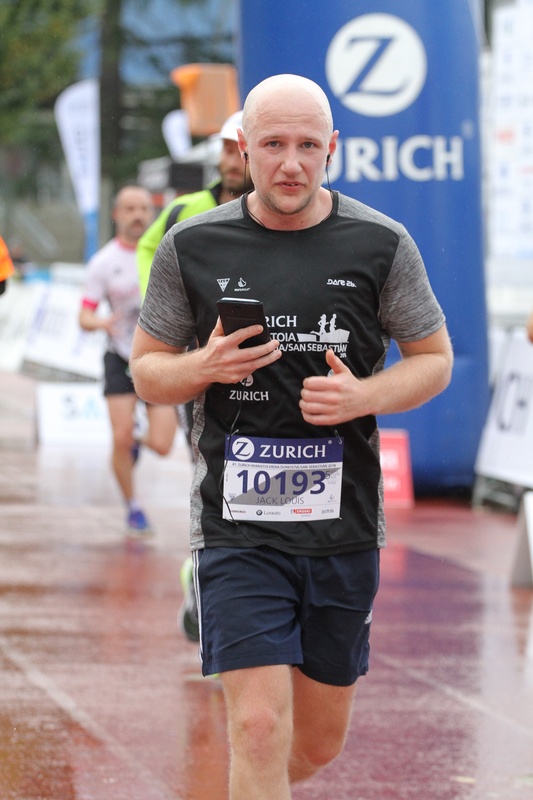 After being somewhat cautious last time round and aiming for anything under two hours (official time – 1:55:29! ), I’d set myself something of a challenge this time and wanted to finish the race in under 1:50. I took my place in the section for people expecting to run at a pace of 5-5:30 a kilometre and waited for the race to start, cursing the terrible music with every passing minute. Finally the race got underway and my group trickled over the start line and we were off. In absolutely bloody typical fashion, despite having tied my laces the same way I always do and never having a problem in the past, one of my laces came undone before I’d even hit the first kilometre mark! I’d say this probably set me back a good 20 seconds and found myself trying to gain them back although I’ve no idea whether I did or not! And that’s about as exciting as it got. 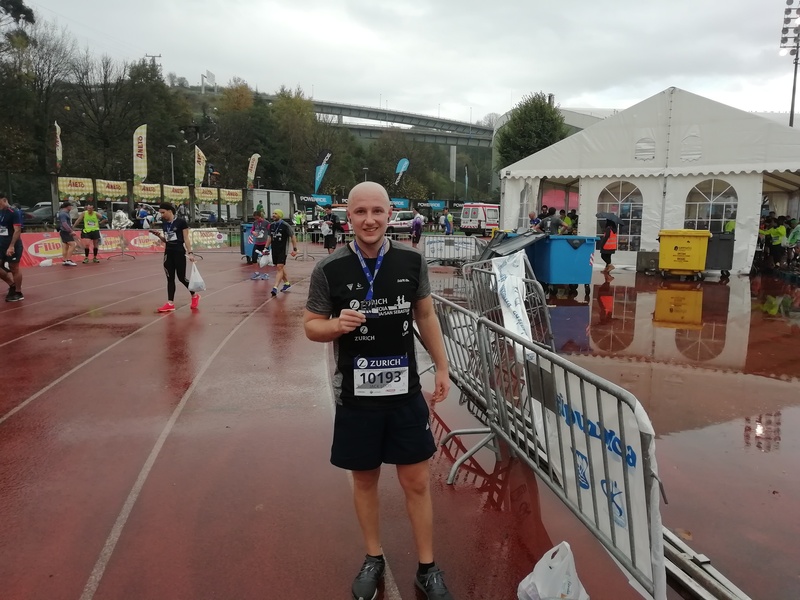 As the race went on I realised I was keeping to an even better pace than I’d expected and actually crossed the line with an official time of 1:43:44 – a whole 12 minutes quicker than six months earlier! Not so smiley after. If you look at the shape of my mouth, you might be able to figure out which word I’m about to say! Again, the size of this event compared to the one in Vitoria was on display when the race finished. After crossing the line I was bombarded with even more goodies and was struggling to carry everything! In amongst the usual medal and Powerade there was also fresh fruit, bags of nuts, biscuits, cereal bars and even a hot cup of the aforementioned chicken stock! 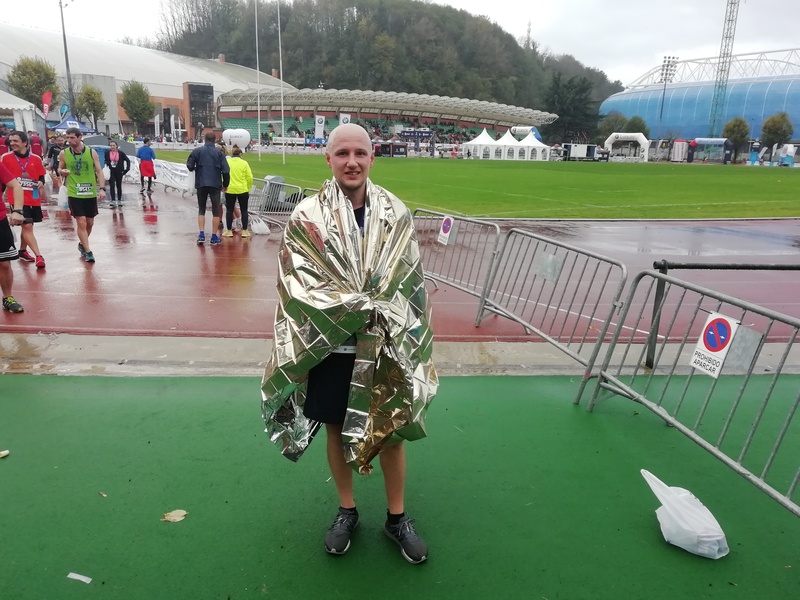 Unlike the previous run where it was absolutely roasting, this time round I took advantage of the foil that was given out and was surprised at just how warm it kept me! I always thought this was just a bit for show but I’m quite happy to chow down on some humble pie with this one! Always thought this foil stuff was a bit overkill – not anymore! After a brisk walk back to my hotel and a shower I quickly headed for the train station and made my way back to Durango. I didn’t have time for a celebratory beer on the way, so stopped off at a shop and picked up a few tinnies for the train instead. You can take the boy out of England, and all that. 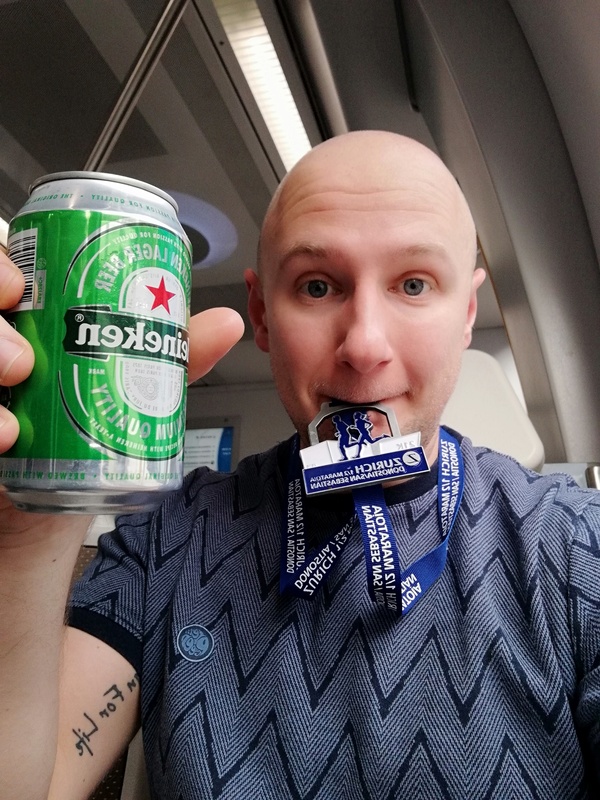 Used to wonder why olympians bit their medals – maybe they’re just practising for when they need to take a selfie and hold a beer. 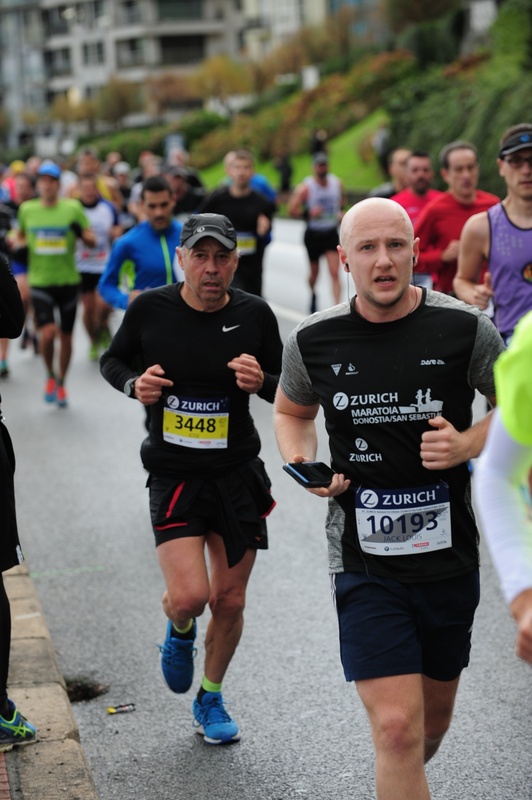 You won’t catch me making any rash statements in the aftermath of this run and the truth is there’s a good chance I’ll end up doing the Vitoria half marathon again in May! Next stop: 1:40 and under! ← A 10 Hour, 500 Mile Round Trip for a Gig! how’s your Spanish coming along? Solid but unspectacular! Functional enough to have a conversation. Got a bit lazy with it recently, my next move will determine how much harder I go at it haha. Are you studying? Are you planning to teach English again. Yeah, I say I’m in love with Spanish but I could study more. Yeah absolutely mate. Doing a masters now in TESOL. Seems I’ve stumbled into a career haha. Have you got any travels lined up? Nice, I am tempted to make TEFL/TESOL my career but it might be hard in the UK. I wouldn’t say so mate, there are plenty of language schools in the UK. Keep an eye on TEFL.com, plenty of stuff on there. Isn’t it time you got an arm-pouch thing for your keitai!! I wear those underlay shirts which footballers wear. Really tight and the long sleeves are perfick for sticking the phone up whilst you run! I do have one but I don’t like it! I’m used to having my phone in my hand and changing tunes/podcasts etc! Thank you for engaging with us!